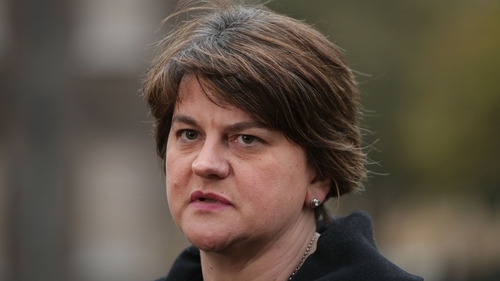 Democratic Unionist Party leader Arlene Foster has condemned the Brexit legal text produced by Brussels as "constitutionally unacceptable" and potentially "catastrophic" for Northern Ireland. MPs from Ms Foster’s party challenged British Prime Minister Theresa May about the issue in the UK’s House of Commons, prompting Mrs May to insist that she could not agree to the terms of the EU's text. On the crucial issue of the Irish border, the draft text spells out in detail how the principle of "regulatory alignment" agreed in December would be implemented if the UK fails to find technological or diplomatic solutions to keeping the border open. If such solutions are not found, the draft text states: "the territory of Northern Ireland, excluding the territorial waters of the United Kingdom ... shall be considered to be part of the customs territory of the (European) Union". It suggests that EU and UK customs authorities should jointly oversee movements between Northern Ireland and the British mainland, while Europe would retain control over aspects of taxation and state aid in the six counties. Ms Foster said: "EU draft text is constitutionally unacceptable and would be economically catastrophic for Northern Ireland. "I welcome the Prime Minister's commitment that HMG will not allow any new border in the Irish Sea. Northern Ireland must have unfettered access to GB market." At Prime Minister's Questions, Mrs May said the EU's text would "threaten the constitutional integrity of the UK" and "no UK prime minster could ever agree to it". She said: "The draft legal text the commission have published would, if implemented, undermine the UK common market and threaten the constitutional integrity of the UK by creating a customs and regulatory border down the Irish sea. "No UK prime minister could ever agree to it." Tánaiste Simon Coveney said the document gave a "necessary legal provision" to maintain the same trade and customs rules in Northern Ireland in the event that no deal can be struck between the EU and UK. Mr Coveney added: "This is very much a default and would only apply should it prove necessary. "This is about delivering on our shared objectives of protecting the Good Friday Agreement and the gains of the peace process, no less, no more."